Screencap of @wheresmyofficenow’s Instagram promo for the “Outsiders” TV show. Once, a Volkswagen van represented freedom, the “open road,” a release from the crushing confines of capitalism. The appeal lives on today. Free love! Damn the man! Live on the beach! Feel the ocean breeze blow through your hair! Pose with a bag of Kettle Chips the #brand sent you to hawk on social media! Wait, what?! Emily King and Corey Smith, the subjects of a recent New Yorker profile that makes me pine for the arrival of nuclear winter, moved out of New York City and moved into a 1987 Volkswagen Vanagon Camper named “Boscha” in order to focus their lives on traveling, mountain biking and surfing. They did so after meeting American surfer and proud 1987 Volkswagen Syncro-dweller Foster Huntington on a surf trip to Nicaragua, who pointed out that they would be happier living in a van. If the story stopped there, I might be a bit jealous. Why do I waste so much cash on a place to live and all the stuff inside when I sort of hate to stay at home? Van life is the simple life. A car is just a room on wheels. You don’t need all that crap, collecting dust. You have it because The Man tells you that you need it. Having things doesn’t bring you anywhere near the pleasure of going out and experiencing the world, or doing something rad. This is why countless hippies did it in the ’60s and ’70s, and beyond. But then the New Yorker delves into how Instagram-perfect hipsters like King, Smith and too many others augment their income: by trying to sell you more crap. 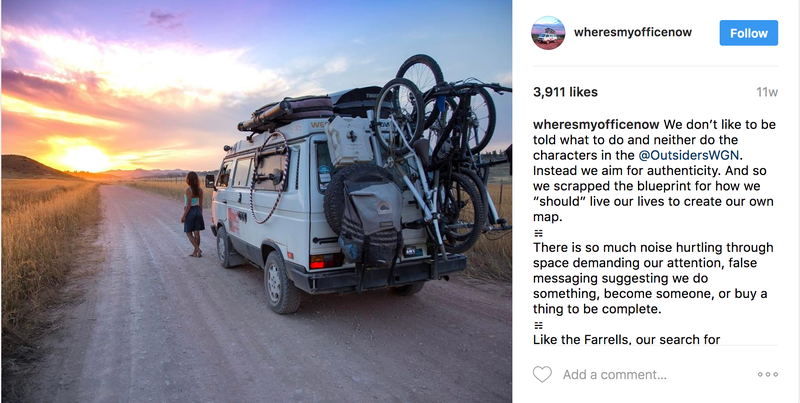 You know, the very antithesis of what makes life out of a van sound attractive to those who are privileged enough to be able to choose between living out of a van, or living in a regular home. But no: living out of a van is now a sellable brand, used to pimp everything from camp food to wakeboards and even van parts. Shed off your worldly goods! But buy these things first, for the trip. Since then, their sponsorships—which King prefers to call “alliances”—have included Kettle Brand potato chips, Clif Bars, and Synergy Organic Clothing. Last summer, the tourism board of Saskatchewan paid the couple seven thousand dollars to drive around the grasslands of central Canada with other popular vanlifers, documenting their (subsidized) kayaking trips and horseback rides. As the afternoon got progressively gloomier, Smith and King transferred their belongings from Boscha to the loaner van: two surfboards (bought at a discount from a sponsor), wetsuits, tins of red lentils and buckwheat, stacks of T-shirts and leggings (mostly from sponsors), a woven blanket (a gift from a sponsor), a hand broom, two yoga mats, three hula hoops in different sizes, a tool kit, a digital S.L.R. camera, and a bag of wheat-free kibble for their soulful, brindled dog, Penny. Live the van life! Support yourself with free stuff, gained by selling your van life to the corporate world you pretended to escape! Everything is great in 2017!